The Ritterkreuz des Eisernen Kreuzes (Knight’s Cross of the Iron Cross), known simply as the Ritterkreuz (Knight’s Cross), was the highest German military award of the Second World War. Instituted on 1 September 1939, to coincide with the German invasion of Poland, it was awarded for leadership, valor or skill. As the war progressed, higher variants were instituted, namely the Knight’s Cross with Oak Leaves, Knight’s Cross with Oak Leaves and Swords, and the Knight’s Cross with Oak Leaves Swords and Diamonds. Similar in design, but larger, than the Eiserne Kreuz (Iron Cross), and worn around the neck as opposed to on the breast, the border and hanging loop on the Knight’s Cross were made of pure silver which was marked ‘800’. The award was made by a number of German manufacturers. On 3 June 1940, the Ritterkreuz des Eisernen Kreuz mit Eichenlaub (Knights Cross with Oak Leaves) was instituted, by which time 124 Rittterkreuz had been awarded to all arms of the German military, of which forty-nine had been awarded to Luftwaffe personnel. The first recipient was Generalfeldmarschal Hermann Göring on 30 September 1939; the first Luftwaffe operational Luftwaffe aircrew member recipient, and the fifth overall, was Oberst Robert Fuchs, Kommodore of Kampfgeschwader 26. His award was made on 6 April 1940. The first fighter pilot to receive the Ritterkreuz was Hauptmann Werner Mölders of III Gruppe/Jagdgeschwader 53 (III./JG 53) on 29 May 1940. Only three Luftwaffe officers would receive the Ritterkreuz mit Eichenlaub in 1940, and all of them were fighter pilots – Mölders on 21 September 1940 (he was then Geschwader Kommodore of JG 51), Major Adolf Galland (Kommodore of JG 26) on 24 September 1940, and Hauptmann Helmut Wick (Kommandeur of I Gruppe/JG 2) on 6 October 1940. Throughout the summer of 1940, many more Luftwaffe members, be they serving on fighter, bomber, dive bomber or reconnaissance units, would receive the Ritterkreuz. Some of these awards were made posthumously, whilst others would learn of their awards whilst a prisoner of war in Britain or, later, in Canada. 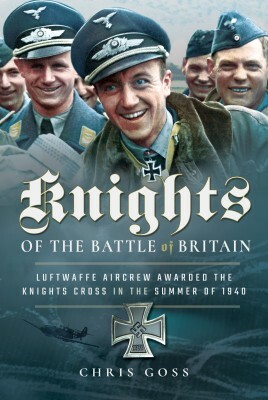 In this book, the renowned aviation historian Chris Goss provides biographical details of all operational members of the Luftwaffe who received the Ritterkreuz during 1940 or were awarded it as a result of their actions in what became known as the Battle of Britain. Having retired from the RAF with the rank of Wing Commander, CHRIS GOSS is a regular and highly respected contributor to major aviation publications in the UK, France and Germany, as well the author of fourteen critically acclaimed books covering the air war between 1939 and 1945. Chris completed an MA with Merit in War Studies in 2001.